This past Friday, I decided to get to Hoof Raw Bar early to avoid any lines. Both Toronto Life and The Grid had recently posted stories about the opening and we were worried it would be impossible to get in. I left work at five sharp and was on Raw Bar’s doorstep before it opened at five thirty. I needn’t have rushed. The room never filled up, and was relatively sedate. It was a pleasant mood, just not terribly energetic. Although both rooms — which are neighbouring — follow the same less-is-more ethos, Hoof Raw Bar feels more fresh and romantic. Everything is warmer, like the candle-style wall sconces and the honey-coloured plywood ceiling (as opposed to the more industrial, corrugated metal at the Hoof). I particularly like the polished, quartz-topped bar at Raw Bar — it sits on a plywood base, and the contrast of high- and low-end materials is interesting. Owner Jen Agg is a cocktail genius. She could probably mix turpentine into a drink and I would like it. Except that she wouldn’t, because that’s stupid and everything she puts together is sophisticated, well-balanced and not poisonous. At the Black Hoof, her concoctions are all on the sweet-sour-bitter spectrum — blood and sand, margarita, a lavender pisco sour. Her Manhattan is one of my favourite drinks, ever. It’s sweet but not saccharine and very smooth, and I like the macerated sour cherry at the bottom of the glass. At the Hoof Raw Bar, Agg is featuring four, savoury-spicy, tomato-based cocktails. I tried the English, a gin-based drink with a curry powder rim and a horse radish kick. I enjoyed it a lot at first but ultimately found it too…everything. Too salty, too spicy, too acidic. I chased it with a beer, which I found more satisfying. On one hand, it’s very hard to compare the menus. 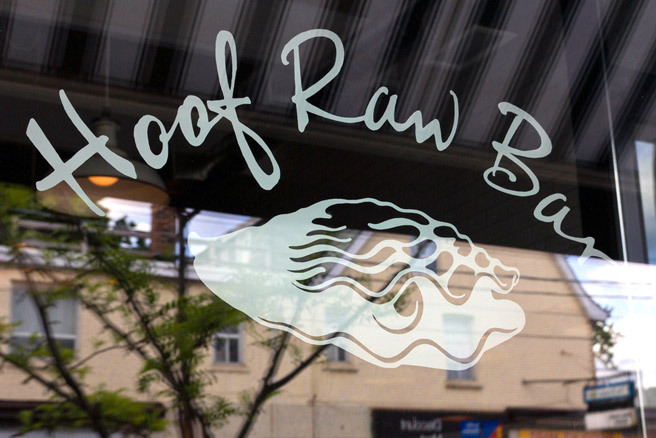 The Black Hoof focuses on offal and off-cuts, while Raw Bar specializes in fish, seafood and oysters. But both are centred around small sharing plates and share a few similar flavours (pickles, smoke, chorizo). And, at first glance, they appear to have a similar ambition: to make over-looked or unusual ingredients shine. It’s in the last respect that the Black Hoof wins me over just a bit more. At Hoof Raw Bar, the fried shrimp heads are outstanding — a tangy barbeque sauce on a crisped-up shell that you can down whole, legs and all, as though it were a potato chip. I also enjoyed the citrusy, cured albacore tuna that was light and refreshing. But neither of those delighted in quite the same way as the terrific tongue sandwhich at the Black Hoof. Or the foie gras carrot cake that was a highlight on my last visit. Don’t get me wrong, everything at Hoof Raw Bar was lovely. Just not AS lovely as the Black Hoof. Yet. I’ll have to check back in when it’s evolved a little more. I suspect the menu is still finding its grove. The Black Hoof still has my belly’s loyalty, though Hoof Raw Bar wasn’t exactly a Speed 2-style disaster. I just think it needs a bit more time to develop it’s own following, and it’s own distinct flavours. This entry was posted in Dinner Conversation and tagged Barbeque, Beef Tongue, Black Hoof, Cocktails, Fish, food, Hoof Raw Bar, Jen Agg, Offal, Restaurant, Seafood, Shrimp, The Grid, Toronto, Toronto Life by mmhague. Bookmark the permalink.